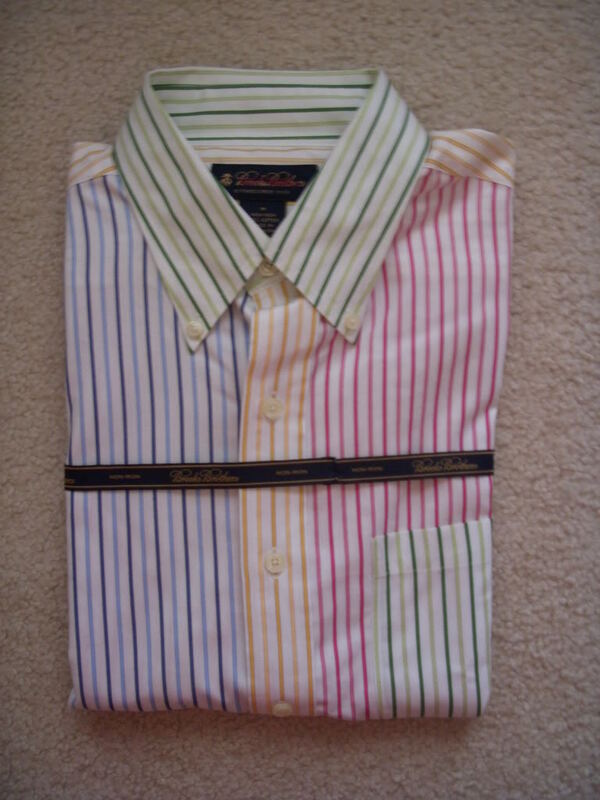 My Go To Hell post featured one of the trad holy grails resting in my closet: the Brooks Brothers "Fun" shirt. Not sure what it is but we trads seem to love our crazy mixing of colors, from madras to plaid and everything in between. 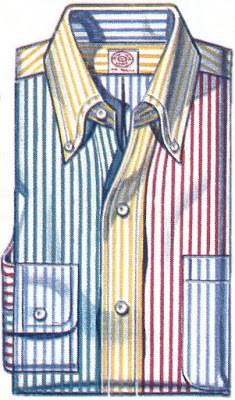 The Fun shirt is a prime specimen of this pigment fixation, and as Heavy Tweed Jacket says, it is the "GTH benchmark" of all shirts. 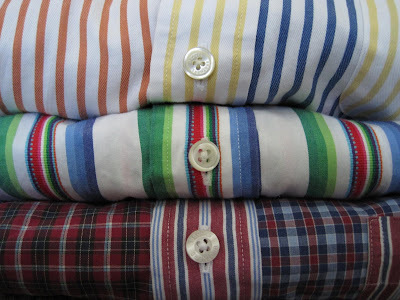 Dearly beloved or strongly despised, the shirt had it's humble beginnings in the early 1980s as the perfect shirt for the preppiest of the preps. As the perverted offspring of an university stripe OCBD, or several OCBDs for that matter, the Fun shirt has gone through many changes in the last 30 years but still remains as one of the most identifiable shirts in the history of going to hell. It is still offered time to time and depending on the season, but unfortunately BB has discontinued the most famous version pictured below. A cousin of the original, a 2009 Non-Iron version. I purchased this at the BB factory store and sold it. I admit I don't wear the Fun shirt on many occasions, although I have three versions of it! Reason being it is too loud to be worn regularly, and you can never escape the noticeable glances from all directions on the event you do take the leap to wear it. That's too much for an unprepared psyche. I tend to put it on when I go on vacations to warm climates (where I don't know anyone and vice versa), the last time being in near-tropical Miami. I also wear it to fancy places where the passerby may be able to appreciate it without gawking. The other main reason is candid but true....it's a gay shirt. Now, I am comfortable with my sexuality but it is what it is. So I would never wear it to somewhere like the classroom, which is telling of the times as if this were 1984, the BB fun shirt would be a hit with my peers, instead of detested and blatantly questioned. So how do I wear the BB shirt without looking like I need a big red nose and facepaint? Same as with all GTH items...very subtly. The shirt is very flashy and cannot be mixed with anything else too bright or overstated. I usually pair it with neutral colored khaki shorts or chinos and a navy surcingle or leather belt. My BB Tartan Fun shirt is for the fall and winter seasons. Here I paired it with chinos and desert boots, although it may work with brown or olive corduroys or wool pants. But since the shirt is dark in hue, I like balancing it out with a light bottom tone. The RL shirt under a navy V neck light sweater. The solid navy downplays the strong pattern of the shirt. Just the right amount of color splash for the next cool summer evening when you're breathing in the sea salt and ocean breeze at the restaurant patio by the docks. 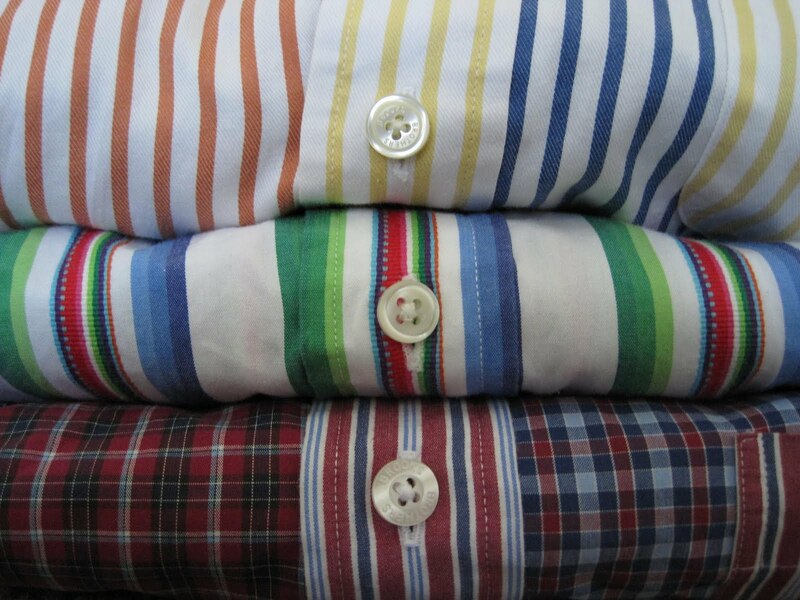 Matching stripes can work, as long as the patterns are different but complimenting. 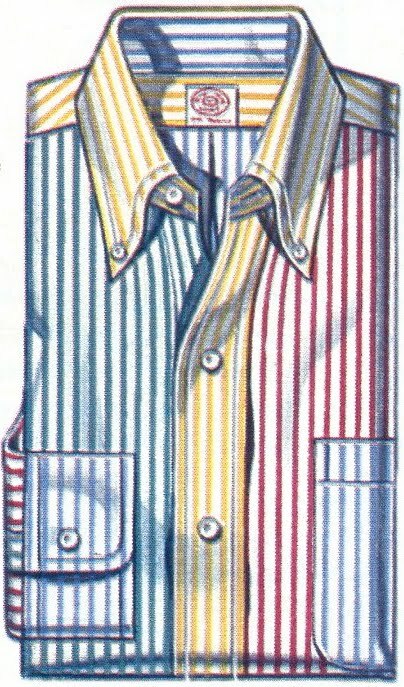 This Brooks Brothers sportsjacket has a quiet rust colored pinstripe which is on the other end of the spectrum with the RL shirt's louder multi-colored stripes. Not sure about wasp labeling... are you white, anglo saxon and protestant? If you want to have a prep style, I wouldn't wear board shorts, jean shorts, cargo shorts or ill fitting baggy clothing. Shorts inseams just looks sloppy in my opinion and it makes you look like a 14 year old kid with basketball shorts and a backwards flat brim cap. Love your combinations you made with your Fun Shirts! It definitely isn't something you can wear every day, nor something that all classic men can pull off, but you do it very nicely! I'd rather not be labeled a WASP or the presumed alternative. WASPiness is a bit of a delusion. It's best mentioned only to debunk. I've stopped paying attention to certain blogs because of the time they spend waxing poetically about some bygone era I don't believe really ever existed quite the way it is thought of. I'm quite proud of my celtic roots and my Catholicism (I'm devout and practicing though I never mention it on my blog). Plenty of Irish Catholics are found throughout American history. Everyone makes a big deal about the Kennedys, but only because there some silly fear JFK would take orders from the Pope. John Kerry is textbook Ivy League (at least until he returned from Vietnam, and he certainly is again). And I think the African-American take on Ivy/Trad/Prep has actually really added something to the style. Japanese Trad (I should know, that's my OTHER country of residence) is pretty damn snappy. @Hilton, shorter inseam shorts in my humble opinion is a direct nod to the preppy type. Only brands like LL Bean and RL would make 6" inseam shorts, and only preps (or WASPs whathaveyou) would wear them. @Dex, saw that linen shirt! Wear it in good health buddy. If it is any consolation, I am not a WASP either, in every sense of the acronym. And am a fellow Catholic.